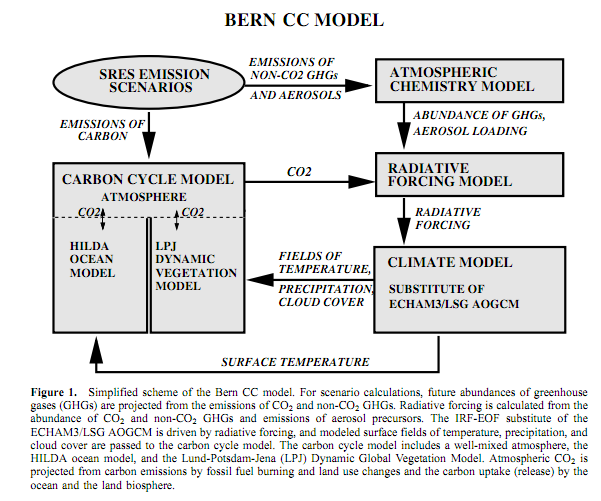 There is unanimous agreement among the coupled climate carbon cycle models driven by emission scenarios run so far that future climate change would reduce the efficiency of the Earth system (land and ocean) to absorb anthropogenic CO2. As a result, an increasingly large fraction of anthropogenic CO2 would stay airborne in the atmosphere under a warmer climate. For the A2 emission scenario, this positive feedback leads to additional atmospheric CO2 concentration varying between 20 and 220 ppm among the models by 2100. Atmospheric CO2 concentrations simulated by these coupled climate-carbon cycle models range between 730 and 1,020 ppm by 2100. Comparing these values with the standard value of 836 ppm (calculated beforehand by the Bern carbon cycle-climate model without an interactive carbon cycle) provides an indication of the uncertainty in global warming due to future changes in the carbon cycle. In the context of atmospheric CO2 concentration stabilisation scenarios, the positive climate-carbon cycle feedback reduces the land and ocean uptake of CO2, implying that it leads to a reduction of the compatible emissions required to achieve a given atmospheric CO2 stabilisation. The higher the stabilisation scenario, the larger the climate change, the larger the impact on the carbon cycle, and hence the larger the required emission reduction. a0 + sum(i=1,3)(ai.exp(-t/Taui)) , Where a0 = 0.217, a1 = 0.259, a2 = 0.338, a3 = 0.186, Tau1 = 172.9 years, Tau2 = 18.51 years, and Tau3 = 1.186 years. If you look carefully at this formula you will see that it is made up of 3 independent CO2 lifetimes each with different amplitudes, plus a constant term implying that 22% of anthroprogenic CO2 will remain in the atmosphere for ever! The sum of the amplitudes is normalised to a pulse of 1.0, and presumably the 3 lifetimes correspond to deep ocean, surface ocean, and land biota absorption seen in the diagram (need confirmation on this). I also note the over-confidence of the modellers in giving 3 decimal places for the coefficients, so I also suspect that these parameters have actually been fitted to reproduce past increases in CO2 on the assumption that the model is a complete description of nature. One objection I have to the form of this model is the concept of using 3 different lifetimes purely from a logical viewpoint, as it kind of assumes that there are 3 different types of CO2 molecule in different queues waiting to leave the atmosphere. I suspect that the model in this form also violates the second law of thermodynamics, since whether there are 3 holes in a bucket of water or just 1 large hole is irrelevant to the rate at which the water leaks out of the bucket. Several others have argued  that some of the observed CO2 increases could simply be due to natural warming rather than all being due to anthroprogenic warming – as for example hapenned following the last Ice age where CO2 levels rose after warming took place. This is the heretical arguement that CO2 levels are an effect of global warming and not its cause. The majority of scientists who argue that all the rise in CO2 is due to human emissions then also can’t account for about half of it (the missing sink). The carbon cycle is therefore not fully understood. It is certainly not a closed book. If we look at the isotope data for atmospheric CO2 we can actually measure how much of the CO2 in the atmosphere is definitely due to man . The results are surprising. Fossil fuels contain essentially no C14 since it has all decayed over the millions of years the carbon has been buried. There is also less C13 (18 p.p.thousand) in fossil fuels than in ordinary air because living organisms take up less C13. Therefore we should be able to measure the fraction of the atmospheric CO2 originating from burning fossil fuels by measuring how these two proportions change with time. The SUESS effect was first noticed to correct carbon dating before the 1950s when bomb testing first started. C14 is naturally produced by cosmic rays in the upper atmosphere and about 10kg are produced each year this way [Houghton ]. After the industrial revolution the concentration of C14 began to get diluted slightly as fossil fuels were burned. This is because fossil fuels essentially contain no C14. The effect was first noticed by Suess who introduced a correction for carbon dating. A recent study from 2002 has measured that the effect up until 1950 was to decrease C14 concentrations by 2.4+- 0.35%. By 1950 CO2 levels had risen above pre-industrial values by about 12%. This also provides evidence that just 20% of the increase in CO2 levels by 1950 was due to fossil fuels. Both these results imply that a maximum of just one quarter of the increase in CO2 concentrations since 1750 are of fossil fuel origin. This means that at least 75% of the observed increase in CO2 is of natural origin. Perhaps a further 15% of this could also be due to human causes – land change, deforestation but it is hard to avoid the conclusion that the majority of it is natural. How can this be ? Have we disrupted the overall carbon cycle such that each year there is a surplus in the recycling of natural CO2 ? Or is this 60% effect due to natural warming which would have occured anyway ? It seems to me that there could be an error in the estimates that the IPCC use for the lifetime(s) of CO2 in the atmosphere? The lifetime of a given sample of CO2 molecules is the time needed for 1/e of the CO2 molecules to leave the atmosphere. An unintended experiment was carried out in the 1960s due to nuclear testing which released large amounts of radioactive C14 into the atmosphere. C14 measurements show how this pulse of CO2 decayed with time and derive a lifetime value. 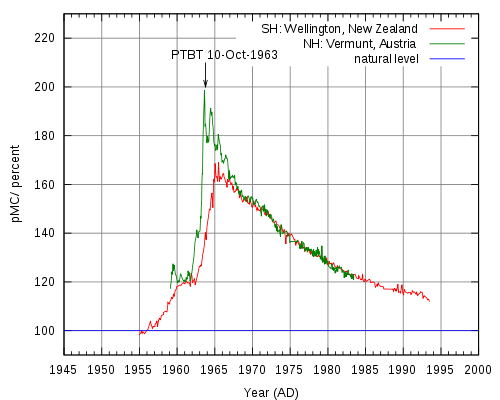 The two decay curves give a pretty good fit to a lifetime value of between 14 to 15 years. Other authors find values ranging from 5 to 15 years based on Natural C14, the Suess effect and C-13/C-12 . Can we understand these numbers using the above lifetime values Tau for CO2 ? The model assumed here is simply that once a year a pulse of N0 = 5.5 Gtons of CO2 is added to the atmosphere due to fossil fuel emissions. This then decays away with a lifetime Tau. Then the accumulation of fossil CO2 in the atmosphere for year n is simply given by. If we assume that n is very large then we can treat this sum as an infinite series and the atmosphere will eventually saturate at a certain value of anthropogenic CO2 concentration. The evidence from the delta C13 measurements, and the Seuss effect would support a lifetime of about 7 years. The direct C14 measurements give a value around 10 -14 years. In both cases the fraction of CO2 molecules in the atmosphere for current emission levels reaches a limit of < 10% of today’s atmosphere. It is only by assuming much higher lifetimes of over 100 years that the IPCC predictions are possible. The IPCC have assumed that all of the apparent 30% increase in CO2 concentrations since pre-industrial times is due to human activity. They are assuming effective CO2 lifetimes of over 100 years in order to explain such levels, plus their models include positive feedbacks to match the data. However direct measurements with C14 and indirect measurements through delta C13 data show that the lifetime of CO2 is much less and seemingly only about 10 years. This leads to a maximum 10% increase in CO2 directly due to a fossil fuels origin (i.e. less than a third of the observed 30% increase). So how can this be ? I think there are only two possibile answers to this mystery. A) The addition of anthropogenc CO2 has disrupted the overall carbon cycle. The sink of CO2 in the oceans is so large that it is releasing more natural CO2 to replace absorbed “Fossil” CO2. The end result is the same but the argument is different. The lifetime for CO2 is small but the carbon cycle is itself rebalancing. B) The Earth has gone through a period of natural warming after the Little Ice Age with a consequent outgassing of CO2 from the oceans as surface temperatures have risen. CO2 levels would have risen anyway. 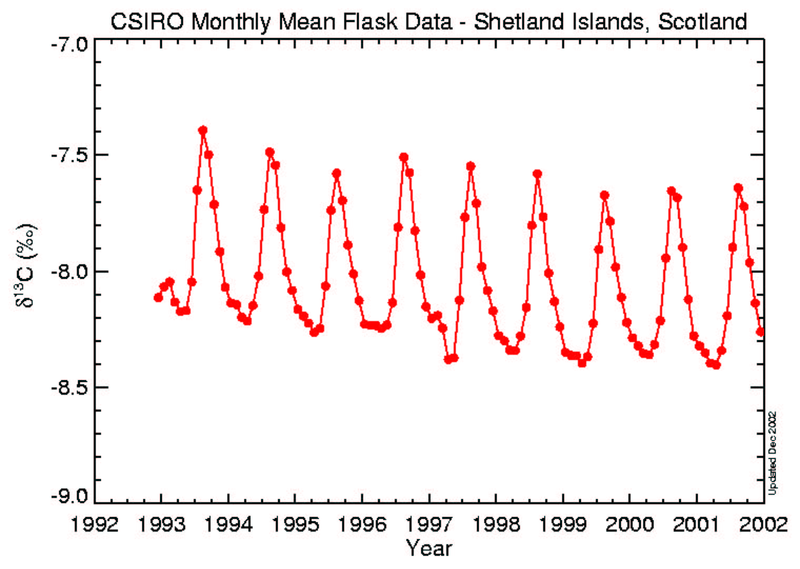 Human activity has added an extra 10% rise to this and increased the warming slightly. In this scenario, temperatures will eventually start falling and CO2 levels should then decrease. The IPCC assumption is that CO2 effective lifetime is much higher. The biosphere needs 100’s of years to readjust…. It depends whether you are talking about the lifetime of a single CO2 molecule (a few years) or the lifetime of a perturbation to the carbon cycle. Usually they refer to the second lifetime when estimating lifetimes of 100 years or so. To command would be to serve, nothing more and nothing less. Whales only get harpooned after they come to the surface, and turtles can only move forward when they stick their neck out, but investors face risk it doesn’t matter what they are doing.